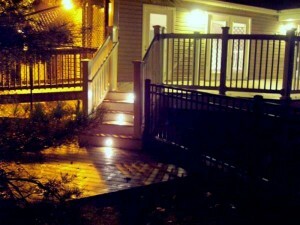 Incorporating deck lighting is an excellent way to make your space even more versatile for evening entertaining. While winter weather is just now setting in for the year, it is never too early to dream up additions to your outdoor space for spring. Although you may already have a beautiful deck to enjoy during spring and summer months of 2019, incorporating deck lighting is an excellent way to make your space even more versatile for evening entertaining. As you are planning any updates to your home in the upcoming year, consider the many reasons why deck lighting is a great addition to your landscape. Although decks are primarily used for spring and summer entertaining, deck lights allow you to enjoy comfortable nights outside in almost any season. Even if you choose to stay inside during chilly fall or winter evenings, deck lights are perfect accessories for lighting up your outdoor space and creating a beautiful ambiance for a night spent at home. Deck lighting can also help to set the mood of your party as you are entertaining guests throughout the year. Let this soft lighting create an accent for your outdoor space by providing your party with a light that is much more enjoyable than a bright floodlight or a simple fire pit. Show off the best of your outdoor space with beautiful downlighting, uplighting, or transverse lighting that will highlight the best of your outdoor space at any time. Similar to the way in which your deck is a focal point of your home, accessories such as deck lighting will also contribute to your decor style and home aesthetic. Be sure to use a variety of different lights in your space to emphasize favorite features of your deck, such as the steps, railings, and design around the deck perimeter. Not only will your deck lights serve as a visual accent to your deck, but they will also add a safety feature to your home. As you entertain guests on your deck during summer evenings, deck lighting will help to ensure that your guests can safely walk around your deck in the dark. Incorporate variety to this safety features by also adding railing lights and step lighting that will help to guide guests down the steps in the dark. Call Mid-Atlantic Deck & Fence For Your New Deck in 2019!